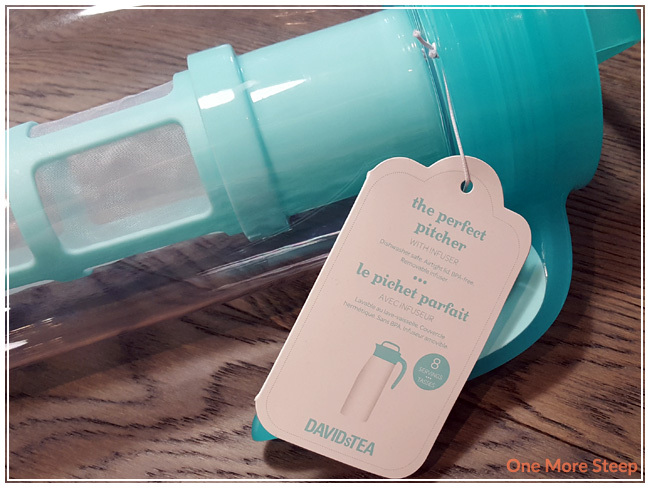 One of the reasons why I bought the Perfect Pitcher was because I needed another pitcher and the other reason is because it qualified me for DavidsTea’s annual Summer Tea Club. Basically how the club works is that you purchase a qualifying piece of teaware and then you get a percentage off of qualifying loose leaf tea purchases (20% off when you buy 100g or more of one particular tea). Since I buy a lot of fruity tisanes anyways for iced teas during the summer, it seemed like a good deal. In order to make this purchase worth it, I’d have to spend $140 on qualifying loose leaf tea purchases to ‘save’ what I already spent on the pitcher but I had a lot of gift cards that had been given to me (from birthdays and Christmases) that I kept on forgetting to bring into the store, so it was a combination of cash and gift cards that made the pitcher worth it (and luckily mostly gift cards). So if you don’t spend a lot of money on tea, it might not be worth it to you if you’re not already in the market for a new pitcher (because, frankly, there are cheaper pitchers out there!). I picked the Soft Blue colour because it best fit with what I had already in terms of teaware and I just liked this colour the best. The tag boasts that the Perfect Pitcher is designed to lay flat, fit inside of a fridge door, and is made of shatter-resistant Tritan plastic (which is BPA-free). The Perfect Pitcher holds 2L (2000mL), or 68oz of liquid. The Perfect Pitcher also has a removeable infuser, and an airtight lid (which is probably good, considering they say you can lay it flat…). Prior to using my Perfect Pitcher for the first time, I unassembled it and washed all the pieces in warm soapy water. The pitcher comes apart into six pieces, with the infuser portion being three pieces. Because it isn’t one continuous piece for the infuser, it makes for easier cleaning if you don’t have a bottle brush, which is nice. The mesh is white, which makes it seem like it might pick up colour easily if you have highly pigmented teas (more on that later). 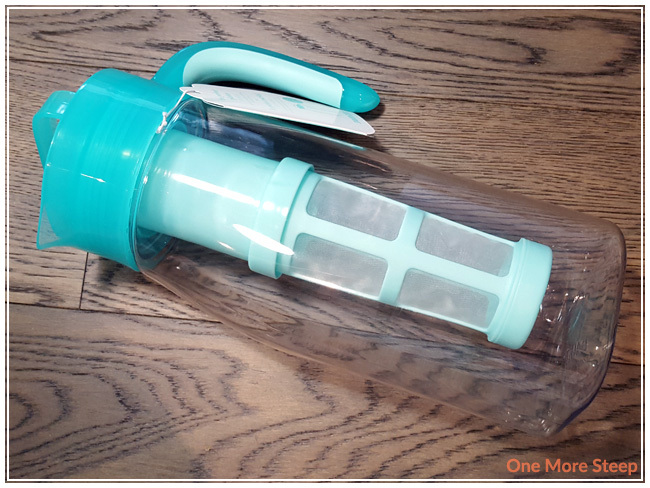 The lid and spout/handle pieces both have an o-ring-like seal layer inside for the air-tight/leak-proof seal. The first time I used the Perfect Pitcher was to steep Mango Fruit Punch for a party. It was easy to use, I just scooped the tea into the infuser and then connected it to the lid. Hot water went into the pitcher and then I popped the lid on for it to steep. I found the infuser easy to clean and to remove the loose leaf tea after I was done infusing the fruity tisane. The white mesh of the strainer wasn’t as bright white as it was when I started – it had picked up a bit of a yellow tinge. DavidsTea’s instructions are to use 4 to 8 Perfect Spoons of dry leaf, and then fill the pitcher half-full (32oz/1L) with hot water, and then allow the tea to infuse as per steeping instructions. 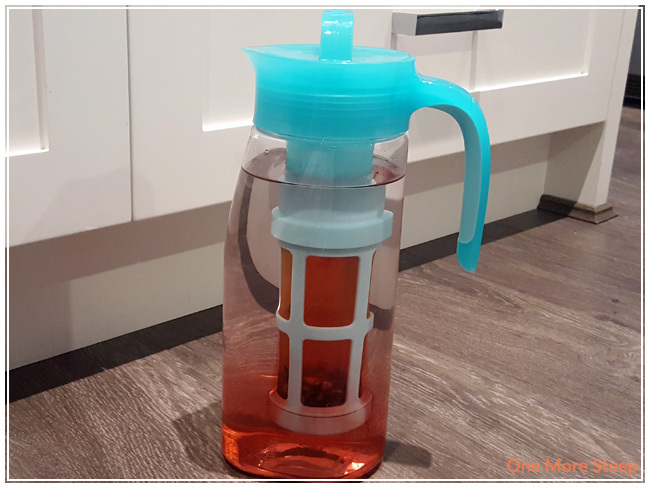 After removing the infuser, you top it up with ice to cool down the tea for an iced tea. I actually use my Perfect Pitcher to make iced tea with all water, and then pop the pitcher into my fridge once it’s cooled down to room temperature, or I cold steep it directly in the pitcher with room temperature water (and popped into the fridge for anywhere from 8 to 10 hours). 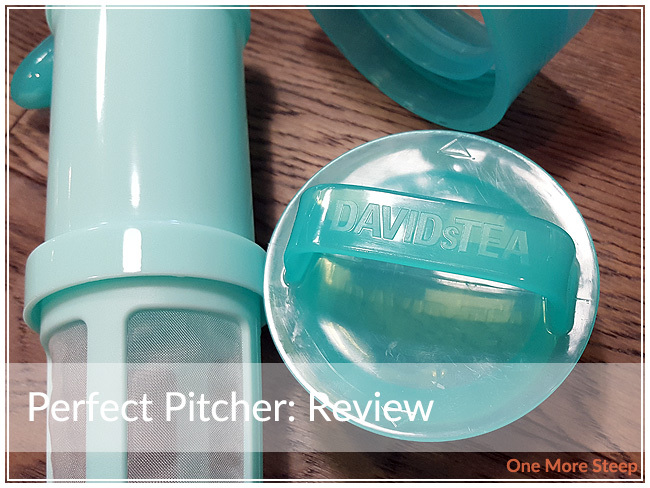 I liked DavidsTea’s Perfect Pitcher. I quite like the design of the pitcher, it’s light-weight and use to use. I find that the handle is comfortable and I do enjoy the colour. I do, however, wish that the infuser’s mesh didn’t pick up colour as easily as it did because I found that it stained with the first use, which wasn’t very fun. 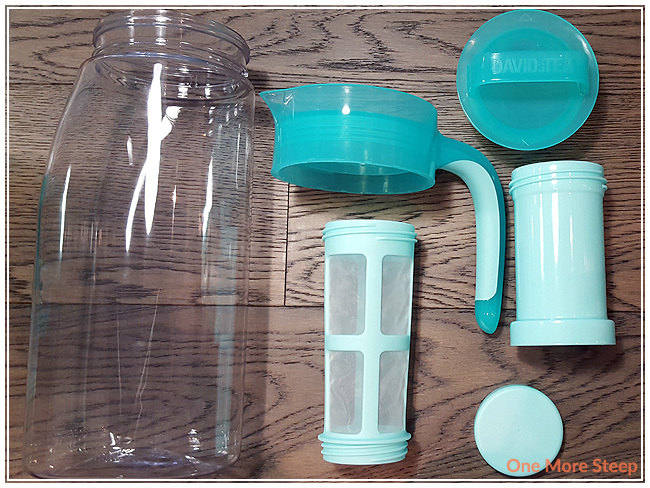 I also would like if DavidsTea produced a glass pitcher instead – I actually own a glass pitcher that I purchased from DavidsTea several years ago (designed by another company) – as I just find glass products to be generally more durable. Sure we’ve been told that BPA is bad for us now, but for a long time it was considered safe so who knows what’s in store for use for the future when it comes to plastic usage? For now, I’ll be using my Perfect Pitcher anyways, it’s super handy to have around and makes for some easy tea steeping. I think the price is a bit steep for what it is, so you’d have to be really wanting a new pitcher to make the price worth it (I thought it was great that I had gift cards to help cover the cost of the pitcher, and my subsequent loose leaf tea purchases! ).